The MDGC-2010 System uses the new and innovative technique of Multiple-heart-cutting. In contrast to conventional Deans Switch systems the Multiple Heart Cut system shows no retention time shift, even after several cuts in the first dimension. Of course also the retention times in the second dimension show extraordinary stability, as you are used to from using Shimadzu gas Chromatographs. 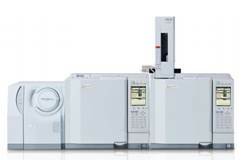 A multi-dimensional GC/GCMS system performs separation using two columns that have different characteristics. The system has a mechanism in which the components that are insufficiently separated in the first column are introduced ("heart-cut") to a second, different column. This enables analysis with a level of separation that cannot be attained in conventional single-column analysis. The multi-Deans switching mechanism in the MDGC/GCMS-2010 uses a capillary method with a low dead volume. Since the internal surface has been subjected to deactivation processing, even in the analysis of alcohols with a high polarity, the peak form is the same as that obtained in GC analysis. For this reason, a superior level of peak reproducibility is attained, and analysis with a high level of quantitative accuracy is possible. Also, even after the multi-Deans switching mechanism performs heart-cutting, the retention times of the peaks eluted from the 1st column hardly change. Consequently, a heart-cutting program can be created easily, regardless of the duration of heart-cutting or the number of times it is performed, by specifying times that encompass parts with insufficient separation and target components in the chromatogram obtained with the 1st column without heart-cutting.